AMD CPU temp sensors demystified. Discussion in 'Processors and motherboards AMD' started by Pill Monster, Apr 5, 2013.
there is only one temperature sensor per CPU (not one per core), meaning there are no seperate temperature measurement values available for each CPU core. the tempeature sensor does not read real physical CPU temperature, so that there can be a rather large temperature difference between the measured and real CPU temperature -- especially if the CPU is idle. Because of this limitation of AMD CPUs Argus Monitor only displays one temperature graph for all CPU cores; the overview tab shows all CPU cores having the same temperature. Some other programs show seperate graphs, one for each core. They might even differ by one or two degrees, but this is caused by different times these measurements were taken (sampled). The value for the CPU temperature of the (digital) on-chip sensor does not equal any real physical temperature but is measured on an AMD spezific scale. This was done to be able to provide more accurate values when the temperature is close to the thermal design limit of the processor and is used to throttle the CPU to prevent damage by overheating. Therefore reliable measurements for CPU idle states is not possible. If the CPU is idle a more reliable reading can be obtained using the analog temperature sensor located in the CPU socket, but its reading is only available if the the mainboard contains an supported Super IO chip. For users with AMD processors Argus Monitor provides the temperature of this sensor in the CPU temperature graph in the default configuration as well. For users with other processors -- or in case the correct temperature channel could not be detected automatically -- the option to display this temperature can be found in Settings/Mainboard. The image above shows the CPU temperature graph for an AMD Bulldozer FX-6100 processor (codename K15). The blue line is the temperature of the on-chip temperature sensor, the red one shows the reading of the mainboard sensor in the CPU socket. The case temperature at the time of measurement was about 25 °C. There is a noticable difference between the CPU socket temperature and the on-chip CPU temperature of approx. 20 degrees when the processor is idle, where the socket temperature of 30 °C delivers a much more realistic and plausible value. After the CPU was put under load both temperatures rise -- with the internal on-chip CPU temperature reacting more rapidly -- and when temperatures reach higher values, the temperature difference decreases. When the CPU is idle again both temperatures decrease and will after some time again asymptotically reach their idle values. Yet it looks like the on chip sensor is more reliable, even at idle. 9C idle from the socket temp sensor, with 25C room temp does not compute! I was thinking about taking my dremel and making a notch in the IHS on my 8350 so I can insert a temp probe. With the probe being that much closer to the CPU die, I wonder how much of a temp difference there would be between that and the socket temp. Nice! I have to say I quite like Argus. It's very intuitive, and gives a great amount of detail as far as whats being monitored. Thanks Phil. I was having a problem even finding a utility that would monitor CPU temp. Core temp jumps all over the place and it seems to me to be monitoring usage and not temp. 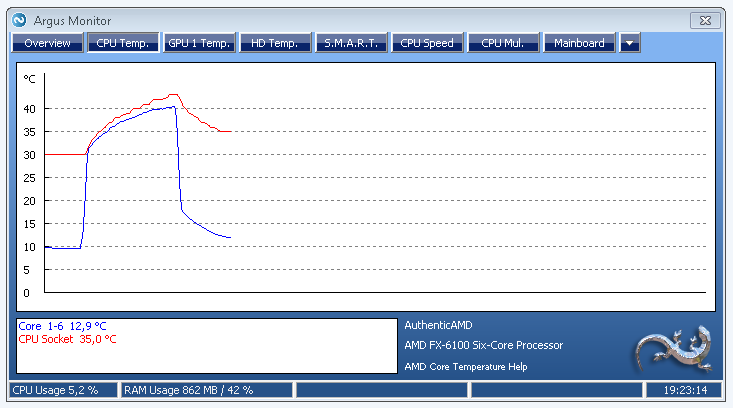 Cool, I use AIDA64 and both CPU/Core temps are send to my G15. The point in that Tctl value is to tell your cooling when you are running cold enough for it to spin down, or, too hot for it to spin up. Nothing else. The temperature control scale should read negative when the real core circuit sensors are near ambient temperature. This is by design, mainly to allow your cooling to spin down and to reduce noise. So Tctl (the reading you are looking at) reading sub-ambients is normal and by design. The scale is calibrated against the core junction temperatures. The scale does not give temperature values in degrees, just Tctl. So when Tctl_Max is reached for any given sample, it's TJunction_Max is reached and the internal Hardware Thermal Control circuitry is activated to throttle the Core. He's right about the F10h design having many temperature sensors, it has more than eight. Only one time-averaged value from these sensors in the Northbridge can be read by software though, so that's what they do. But this value is not given to end users in degrees, only on a non-linear scale to control the fanspeeds. It is directly linked to the real core temperature circuitry time-averaged readings though (Tctl_Max is usually 70 and Tjunction_Max is usually 115-120 degrees C internally). Since I'm not in a position to explain these days, here's two old related links to kill some myths. That doesn't really demystify anything, sadly. Not that it isn't helpful, but this does not explain the actual implementation. Which is a shame, because I'd really like to know. Hi, guy who wrote that post is mistaken, the 1055 only has 2 sensors just like all Phenom II's. The articles he linked to are from 2007, the X6 wasn't released until 2010 nearly 3 years later. Furthermore the articles have factual inaccuracies, for example EE Times states that each core has it's own power plane when in fact the voltage is constant across all cores. At least the CPU can at least be read accurately using lm-sensors in Linux since it does support IT87xx Super I/O chips, but will require a manual compilation especially for the IT872x chips unless you're running Linux kernel 3.8+.